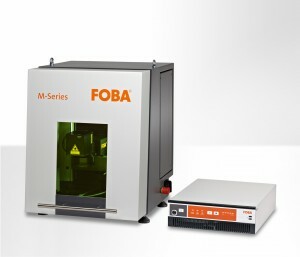 Selmsdorf/Lüdenscheid, July 2013 – With FOBA M1000, FOBA Laser Marking + Engraving introduces a compact desktop laser workstation for the economic laser marking of individual parts and small batches. The compact manual laser workstation FOBA M1000 has been designed for the high-quality laser marking of small to medium sized parts, work pieces and batches. The easily accessible work space offers enough space for the processing of work pieces up to 450 x 250 x 200 (mm, width x depth x height). In addition to the automotive, tool and metal industries, the small and portable universal marking machine is well suited for various medical, plastic and contract manufacturing applications. The new workstation processes small metallic and plastic components but also batches of parts – both economically and in high marking quality. The laser class 1 marking station is equipped with a programmable Z-axis (for positioning the marking laser), a small work table (450 x 250 mm) and a wide opening lift door. The complete workspace has excellent visibility and is easily accessible from three sides. In order to cover a broad application range various fiber marking lasers are available for integration in the M1000. These laser markers create high-quality marks both economically and reliably even at low-volume productions. The completely air-cooled laser sources are configurable and almost maintenance-free. As a standard, the M1000 is supplied with an integrated lighting, a large window and an exhaust nozzle. On request, the workstation can also be equipped with a rotation axis. The ergonomic manual workstation has been designed for both benchtop or cart mounted operation at the user’s discretion. The easily and wide upward opening door and the easy loading and unloading virtually on table height ensure comfortable working. The large laser safe window in the lifting door allows the operator to maintain the overview even during the marking process. With its minimal footprint and generous working are, the user-friendly M1000 offers both ease of use and easy integration in various environments for low- to medium-volume production requirements.